Partly Sunny, Pleasant and Calm, Water Temperature 45* and Clear. Today is Nathans birthday, he has a tradition of fishing with me on all his birthdays. He brought along with him his best fishing buddies and his Bulgarian Babe, Lovee. Nate is DC fishing fool on You tube, the fishing addict who catches Snakeheads by hand. We all knew we were in for good times today so we simply went fishing and had some fun. We caught bait and fished an area till 10:12, the minute Nate was born, then had a Mimosa as a toast to his life then relocated. We pulled boards for the rest of the day in numerous areas with minimal success, but as you can see in the bottom picture of Nate, who cared! We all knew it was a weekend and no one expected a banner day of fishing but when it was all said and done we did exceptionally well. Partly Sunny and Cool, Water Temperature 43* to 47* and Clear. We caught bait at daylight and set out a spread of a dozen boards and a bobber pulling 25 foot flats. After 2 hours, 12 strikes and only 2 keepers I decided to make a move. We relocated and boated 4 quick Stripers. A boat moved in next to us and kept running his trolling motor around us [within 20 feet] threw an anchor into the water a couple times and guess what? Spooked those fish. We moved to 2 other spots but the east wind was blowing making it hard to control the boat. We ended up catching 16 fish today, not a bad stringer considering the wind and weekend boat traffic. Cloudy and Cold, Water temperature 46* and Clear. Driving to the lake this morning I had my concerns about what the day would bring. The moon was full and bright [Stripers feed hard at night with a full moon] and the weather report called for an East wind all day, didn't like starting the day off with 2 strikes against us. I was still optimistic about catching fish, but I thought our chances of catching some Big Stripers would be hindered. We launched the boat, went and caught bait, set out a huge spread of boards and free lines. Before we knew it we were taking hit after hit, the guys reeling the fish in while I baited and put lines out. We made our first pass on a flat, took about 10 hits, turned around and pulled the same area with only a couple more takers. We moved on hitting another productive area nearby boating 3 or 4 more fish. I decided to get the baits in and make a move to an area that we haven't fished lately hoping to boat a few larger Stripers. 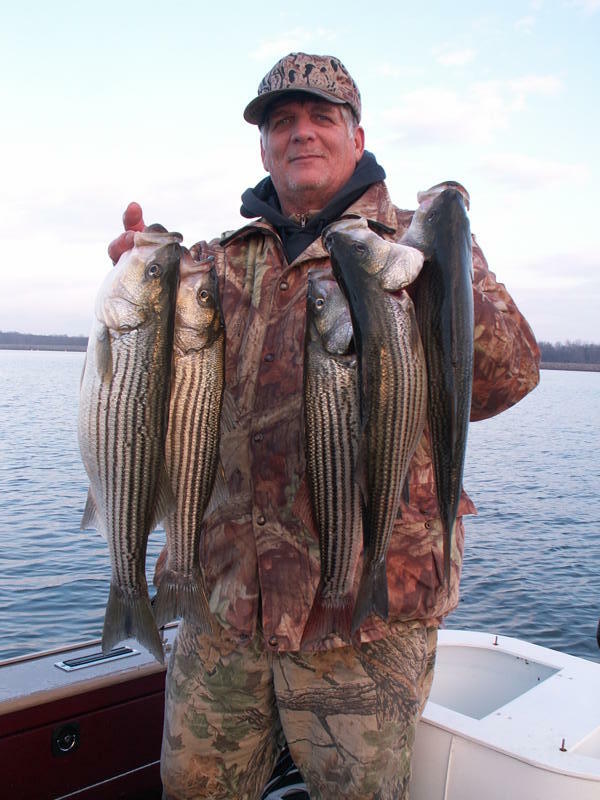 The move paid off, we boated 4 nice Stripers within 10 minutes but we spooked the fish and turned them off. We had to make 3 more moves to different areas but only would catch a few fish in each area, nothing to get real excited about. We ended up today catching over 25 Stripers, not a bad day considering the conditions. The cast net in the picture is covering about a 20 foot circle, that is how we catch bait for the trip. 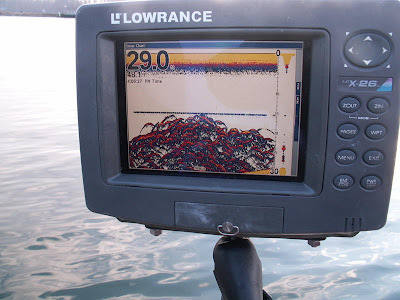 The Lowrance is showing a school of Stripers we fished today, you can see our sinker coming through the fish at 28 feet. Our bait on the hook is just above the sinker trying to get away from the Stripers. Brian and Walt are pictured holding a few of the fish we caught and kept today, all others were released unharmed to fight again another day. There is a strong cold front moving in tonight that will mess fishing up for a few days. I will be staying off the water this weekend keeping warm and enjoying some time with my grandson, Michael. Cloudy and Cold, Water Temperature 43* to 45* and Clear. I picked Robert up at 7, caught bait and went fishing. We set up over 25 foot flats with numerous points and humps nearby pulling 12 planner boards and a bobber. Since I had only one angler in the boat today I did not want to fish areas where the action would be out of control, I only put out 13 lines working areas that held fish but not schools of fish. We hit a few different spots taking plenty of hits but only hooking up with about a third of the strikes. After about 35 hits I decided the fish were just not wanting to eat so I told Robert to help me get the baits in, we were going to do something completely different. We made a big move, started putting baits out and hooked up after only getting 3 baits out. The move paid off, these fish wanted to eat. We caught 4 or 5 more and called it a day. Robert kept a few fish to take back home and we released the other fish to fight again. Sunny, Cold and Calm, Water Temperature 45* and Clear. Realizing it was going to be relatively calm this afternoon Anthony and myself were thinking the same thing, he called me around 1 in the afternoon and said he could leave Richmond and head to my house, I said lets go. We backed the boat into the water at 3:30, located some bait, threw the cast net and loaded the tank. We set up over 20 foot flats pulling a spread of boards, bobber and free lines. We no sooner hit the area where we hoped the fish would be holding when we saw the Stripers on the Lowrance. We hooked up with 3 nice Stripers on one side of the boat, landed them and rebaited. We continued about 100 yards without a hit so I decided to turn around and hit the area again. In the turn the furthest board on the inside hooked up, Anthony reeled it in but it had already tangled up 4 other boards. We netted the fish, untangled the mess and got the baits back out before we hit the juice. Good thing, next thing we knew we had fish hooked up for the next 45 minuted till we just couldn't see well enough to put the boards out. I snapped a picture of Anthony holding one of the fish we caught when we weren't busy reeling in fish. We didn't take a stringer picture because we released all the fish we caught this afternoon. We caught over a dozen Stripers in a a 2 hour time frame, all of the fish better quality than the fish we have been catching the last month. Tis the season for the larger fish to start feeding. Five days ago the weather forecasters predicted snow for today. Some of my best fishing since '89 when I moved to the lake has been in the winter during snow storms. Three days ago I noticed there would be no wind. My phone started ringing, Anthony and Brian also knew of the potential of fishing in the snow so we planned the trip. Anthony was to pull my boat with his Excursion, Brian was going to follow us in case he had to leave early to take care of his 1 year old son or if the road conditions warranted his early departure, and a client/friend [Nathan] drove from Springfield and met us at the ramp. We were in no hurry to get to the lake, it has been an evening bite lately so we arrived at daylight, went and caught 130 baits and went fishing. We pulled a dozen boards and a couple freelines all day working flats, humps and points where we believed we could catch a Hog. After working the first area thoroughly for a couple hours only to catch a few punks and a keeper fish or two we hit 4 other areas with the same set up only to have the same success. At 3 o'clock we caught more bait to prepare ourselves for the anticipated evening bite and set out our spread one final time. We took a few hits and then a friend called me to see how we were doing and said the roads were icing up. We took a vote on the boat to see if we all wanted to stay and fish or get off the water and get back home due to the weather. I was surprised to see that our desire to fish lost to common sense and survival. We hesitantly loaded the boat and headed home. Anthony was driving about 25 mph and about 3 miles from the ramp on what appeared to be just wet roads he simply let off the gas and broke loose. The boat trailer started fishtailing going from shoulder to shoulder trying to pass our tow vehicle. Amazingly Anthony kept his cool and controlled the runaway trailer gaining control of the moment. I immediately called Brian who was following us to ask him if he had any spare underwear in his Jeep. He was in shock of what he had just witnessed and informed me that not only did he loose control but Nathan had also. Anthony put his Excursion in 4 wheel high and crept the rest of the way back to the boat shed. About a 1/4 mile from where our episode took place was a 3 car accident, vehicles in the woods. We made it home without further incident but not so good for Brian. Before he got to 95 he had passed 4 or 5 other areas with cars in the woods and shortly after passing one of the accidents Brian lost control of his Jeep, did a 360 and went through 2 concrete pillars at the entrance to someones driveway, ending up in the driveway without hitting a thing. Nathan had witnessed it all and was in disbelief. We all made it home safely, fortunately with no damage to ourselves or vehicles, but hopefully a little smarter [Duh!]. Back to fishing... We never got into any nice fish today, caught plenty of punks, a limit of Stripers, 3 Bass and a Catfish. Nathan is holding a couple of the Bass he caught. Sunny and Cold, Water Temperature 45* and Calm. Anthony and myself wanted to fish together today so we planned a day on the water taking a friend out in the morning, dropping him off at noon then picking up another to fish with us for the afternoon bite. Anthony caught bait, we met Carlos at 7:30 and went scouting for fish. We set up on an area nearby the ramp, we wanted to try places today we thought should hold fish that we haven't fished recently. The first place we pulled resulted in only a couple hits catching punks only. We moved to another area, found a school of fish and pulled 15 baits through them only to get about a dozen short hits. We then knew the fish were not feeding but we continued to fish. We hit one area where we took 7 hits and boated a couple fish, only 1 would keep. We dropped Carlos off, picked up Ed and Wilson, caught some more bait and pulled a deep area where we hoped fish would be. After working a half mile stretch we hit a point where we took a few hits and boated a fish. About 100 yards further we saw fish on the Lowrance and popped a few fish off of a ledge. Numerous boats were watching us so we decided to leave the area before they saw us catching fish. We then set up in a creek and pulled out to the main lake working flats and humps. As soon as we got our spread out we took 4 hits on boards on the port side of the boat and hooked up with 2 very nice Bass. Wilson is shown holding a citation Bass along with the other Bass that hit at the same time. We released the fish and worked a nearby hump for the rest of the evening until other inconsiderate boaters ran over the spot spooking the school. [It is still hard to believe what compels boaters to run over where anglers are set up fishing instead of giving the anglers a wide birth avoiding the area as much as possible]. Guess what, when it is calm out, winter time with little boat traffic and a boat runs over a 10 foot flat, it turns the fish off! A better choice wold be to avoid fisherman as far away as you can, especially when the lake is a half mile wide where the fisherman is. Anyway we had caught plenty of fish this afternoon, 3 Bass and 12 Stripers, kept a few for the table and took home some good memories of a beautiful Lake Anna. Cloudy and Cold, Water Temperature 44* and Clear. The wind was light today so I called a couple of friends to go look for fish. We met at High Point at lunch time and headed out looking for bait. There was plenty around the marina so we caught bait and looked for fish. I saw a few fish over 30 feet of water between 13 and 20 feet deep so I idled a couple hundred yards past them , turned around and set out a spread of 12 boards, a bobber and a few free lines. Before we got the lines out we started taking hits. Joe reeled in a 5 pounder then Tony lost a couple. We went a few hundred yards and went over 40 yards of fish but only got 1 taker, Joe reeled it in and Tony lost a couple more fish. 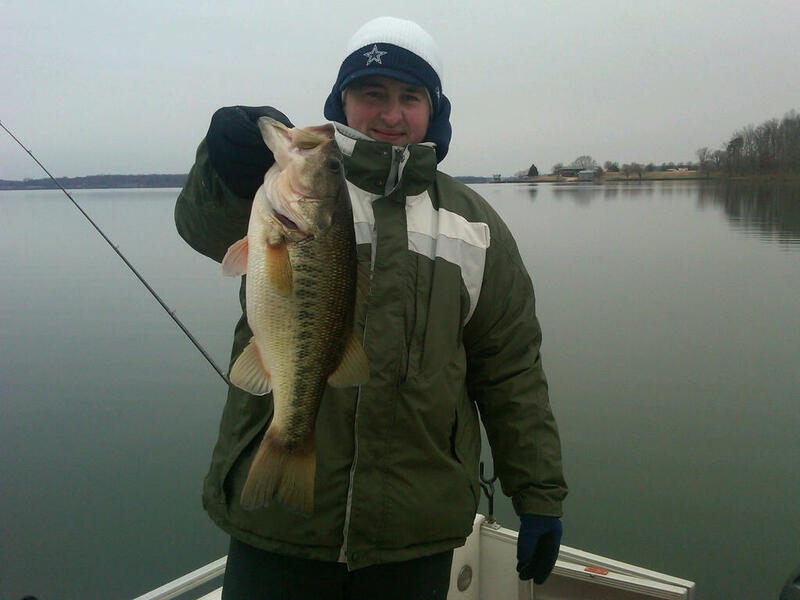 We hit a main lake point and 3 more lines went off, Joe reeled in a keeper and Tony lost a couple more. I decided to get the baits in and check out another area but saw no fish there. We ended up setting up our spread and pulled flats till dark, Joe catching fish all the way and Tony loosing fish. Just about dark a nice fish hooked up and I told Tony to grab the rod. He did and landed the fish, although he took out the whole side of boards. It was great to get out this afternoon with friends and fish different areas of the lake. Joe and I had fun with Tony, we gave him a lot of grief but it wasn't quite as bad as I make it sound. Tony is a great fun loving guy and we had plenty of laughs. The guys are pictured in my boat shed holding a few of the fish we caught this afternoon. We released a bunch more to fight again another day. Here are some of my clients January catches of the past couple years. Now that the holidays and Hunting season is over I will be back on the water on a regular bases. 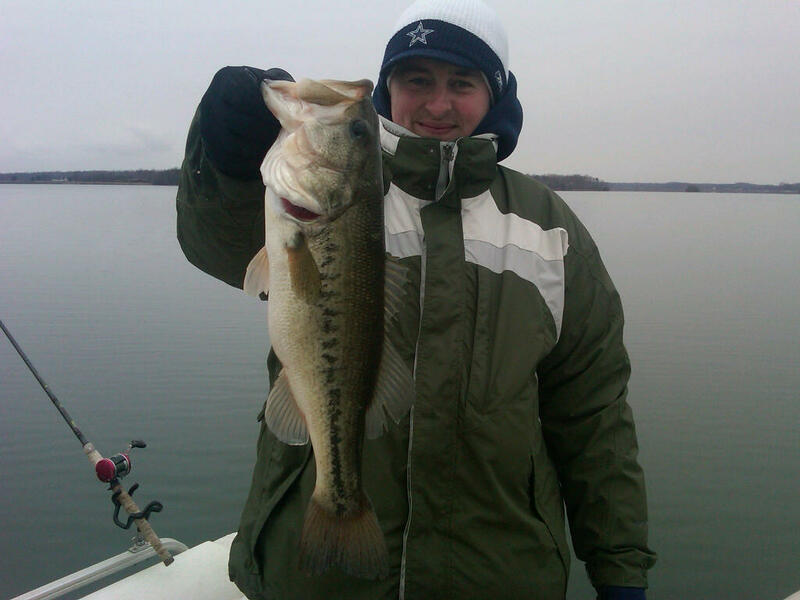 The cold winter has killed a lot of the bait which will only result in better fishing this year. John, Anthony and myself would like to wish you a Prosperous and Happy New Year.